Soon after the tragic mass shooting in Las Vegas, the White House batted down the idea of enacting more gun control with the argument that many cities with strict gun laws have high murder rates. The White House specifically pointed to Chicago and Baltimore as “some of America’s cities with the strictest gun laws” coupled with “the highest rates of gun violence.” While the statement has some merit — Chicago and Baltimore had the first and third most murders nationally in 20161 — evidence suggests a city or state’s gun laws may only be as effective as those of the state next door. For instance, an NPR fact check of the White House talking point noted that Chicago is close to the borders of two states — Wisconsin and Indiana — that have weak gun laws. 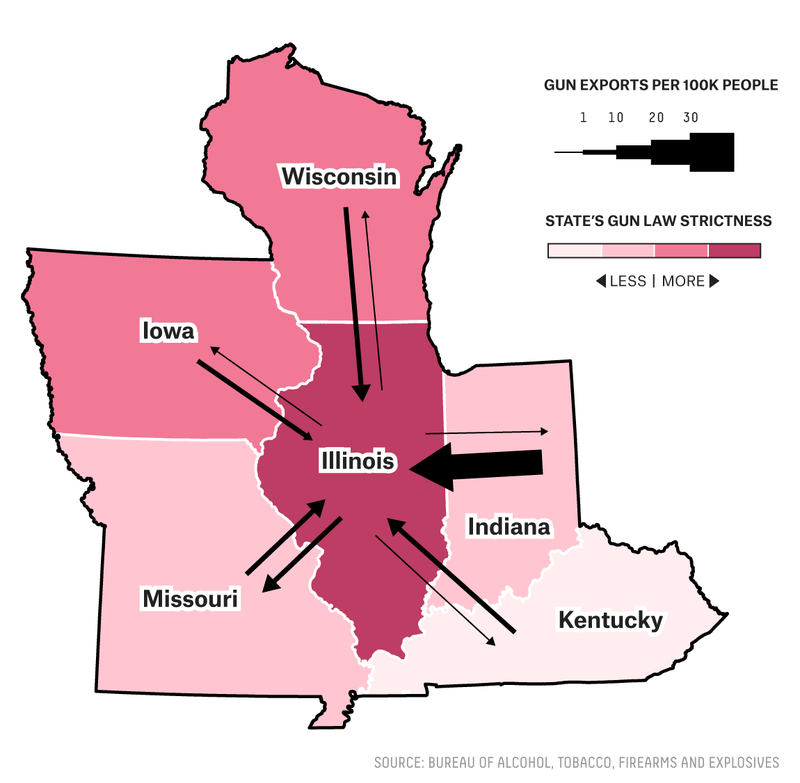 A 2014 report from the city of Chicago noted that 60 percent of guns used to commit crimes in Chicago from 2009 to 2013 originated outside of Illinois, and Indiana and Wisconsin were two of the biggest sources of recovered guns.5 And Illinois is not alone. To track the movement of guns between neighboring states, we started with the ATF’s handy matrix of the number of firearms recovered in each state in 2016 for which the state of origin is also known. 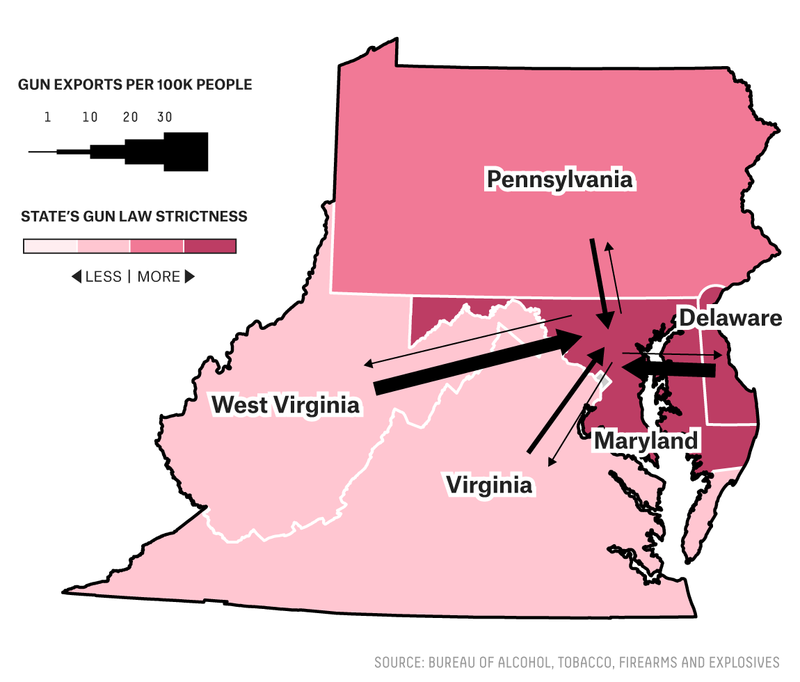 Next we identified what might be called “neighbor pairs,” or pairs of states that share a border, and compared how many guns originating in one state were recovered in the other. We then measured the difference in gun laws between states to identify which ones have looser gun laws than their neighbors. To do this, we created a gun law ranking for each state by averaging the ranking of the Cato Institute (a gun rights supporter) and Everytown (a gun control supporter).6 Each state was given an average ranking of between 1 (least strict) and 50 (most strict) and compared to its neighbor to establish a net ranking between the two. Each pair of neighbors contains a source state where the firearms were originally purchased and a recovery state where the firearms were finally located. This produces 214 pairs of neighbors made up of a source state and a recovery state. Half of those pairs were removed to avoid double counting — tracking guns that started in Alabama and wound up in Mississippi is just the inverse of tracking guns that were recovered in Mississippi and originated in Alabama — so we took out the pair where the source state had looser gun laws (ties were broken by which state comes first in alphabetical order).7 Then we measured what I’m calling the firearm trade differential between the states in a neighbor pair, accounting for the combined populations of both states. The final product is 107 pairs of states in which the relationship between gun laws and firearm recoveries can be explored. The Cato Institute’s ranking is based on which of 25 selected gun-control laws each state has passed. Everytown tracks 67 such laws in every state, and the ranking shown here is derived from their data. By analyzing these pairs, we found that the relationship between gun laws and firearm recoveries generally appears to be more pronounced in states with larger differences in the strictness of their gun laws. Illinois and Indiana are 28.5 points apart in our combined gun rankings, and in 2016, for every 100,000 residents of the two states combined, Illinois recovered nearly 6.5 more firearms originating in Indiana than Indiana recovered guns originating in Illinois. 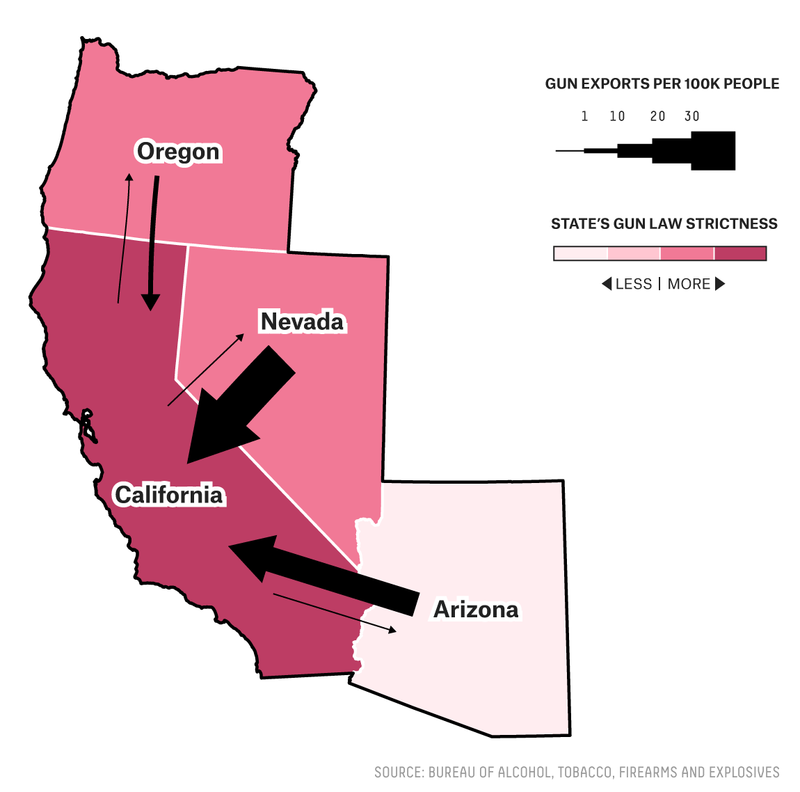 California recovered firearms at higher rates from neighbors Nevada and Arizona (15.5 and 40.5 points apart from California in our rankings), where gun laws are looser, while Maryland has a similar relationship with West Virginia and Virginia (each 21.5 points away from Maryland). The ways that gun laws affect weapon recoveries is clearly complex. 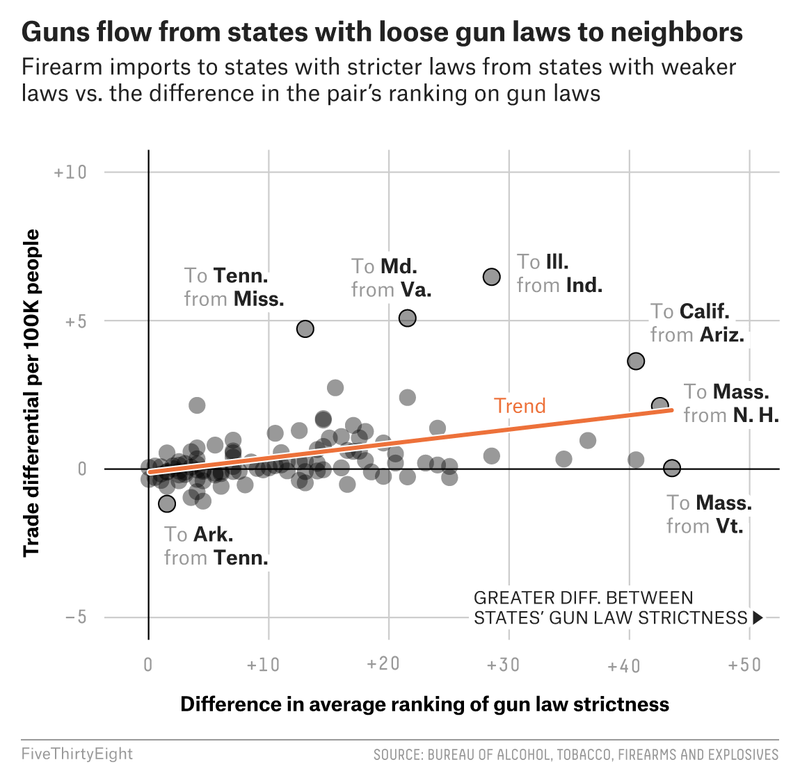 Overall, the relationship between the two factors is decent but not extremely strong,8 and plenty of neighbor pairs have large differences in the strictness of their gun laws but only a small differential in the relative size of their gun trade. Vermont, for example, has far looser gun laws than Massachusetts and New York, but the gun trade between Vermont and each of those two neighbors is fairly even. Given the noisiness of this relationship, it seems likely that other factors, such as the effectiveness of local police departments, the way existing gun laws are enforced, and the distance between major cities in each state, could also be contributing to these discrepancies. Part of the challenge is also that the ATF is unable to trace all firearms, and the traces they do run do not reveal what happens to the firearm during the decade, on average, between when it is purchased and when it is recovered.9 Simply put, there’s a lot we do not know about this subject. The available evidence does, however, show that gun laws in one state seem to affect their neighbors, which makes this an important area of study in efforts to better understand the flow of firearms used in crimes. Raw total of murders in each city, not accounting for population and not including the larger metropolitan area. Defined here as any two states that share a physical border, including states separated by rivers but not including state pairs like Hawaii and California or Washington and Alaska, which are separated by an ocean or another country. The number of crimes committed with a gun is many times larger than the number of guns that are recovered and linked to a crime, so it’s almost certain that the vast majority of firearms used in crimes in a given year are not recovered and are therefore unavailable to be traced. The ATF’s National Tracing Center researches, at the request of law-enforcement agencies, the history of firearms from their manufacture to their first retail purchase. To track guns from their first purchaser to the point where law enforcement recovers them, police and federal agents must conduct their own investigations. Because the ATF only traces guns at the request of law-enforcement agencies, all but a fairly small percentage the guns it tracks are linked to a criminal investigation or criminal activity of some kind. On average, roughly 72 percent of traced guns in each state originated within that state. The percentage varied widely, though, from as little as 21 percent (New Jersey) to as much as 84 percent (Texas). In states with stricter gun laws, a smaller percentage of recovered guns tended to have been originally purchased in that state. They were first and third, respectively, as the sources of total guns used in crimes in Chicago over that period. Second was Mississippi. This decision was essentially arbitrary, in that any system of eliminating duplicate pairs would work, but this allowed me to avoid negative numbers when we calculated the net gun law ratings. r=0.41, significant at the p<0.001 level. The average time from legal purchase to recovery by law enforcement throughout the U.S. in 2016 was 9.8 years.